First stop was Defiant Brewing in Pearl River NY. Legend has it that this was called Muddy Creek until actual pearls were discovered in the creek. 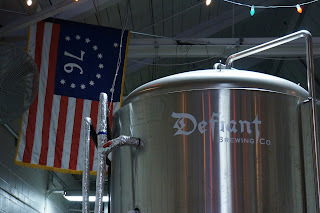 And today we have the same metaphor, a "pearl" in the form of Defiant Brewing. 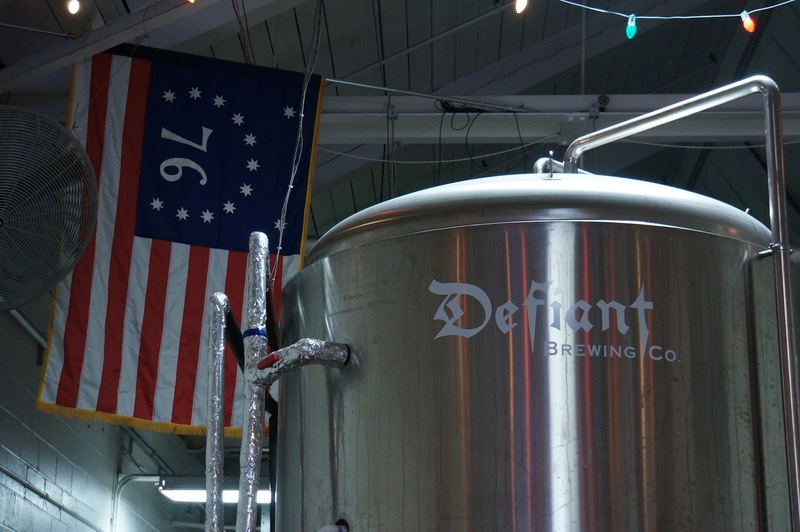 Defiant sells mostly kegs and growlers, but as luck would have it they also had limited numbers of "caged" 750 ml Christmas ales. That was good, as one was purchased - ostensibly to have at Christmas. Growlers would not do, as I'll be gone traveling well over a week. The brewery is located in a small industrial area across from the metro station; so there's a dream locale. Commute to NYC, stop in the brewery for a beer after work. The bar (which apparently serves food Fridays/weekends) is cash only, which caused a bit of consternation, until told there is an ATM in the back. The only negative aspect of Defiant - for a person sampling beers - is the complete absence of "flights" (a group of 5-8 small glasses, typically priced $5-$12)! Altho regular servings were priced very fairly (starting about $3.75 for a 10 oz glass) I was not intending to drink that much, and certainly was not going to spend $30-$40 to try the beers available. Now maybe if I had asked for a "taste" of each that would have happened (it was not very busy, they just opened at 2:00 PM), but that generally becomes annoying, and Club-Belgique members do not like to annoy anyone, especially employees at a brewery! C) I will stay in a local hotel and just drink! 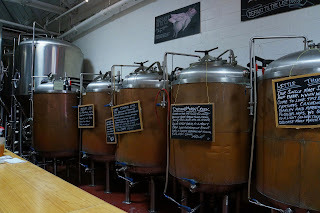 Next stop was at the J. J. Bitting brewpub, Woodbridge Township NJ. Named one would suppose as they built the first wood bridge over a stream, maybe a tributary of the Muddy Creek? J. J. Bitting's is a boisterous, friendly "local bar" - staff was wonderful and the barmaid - even though only tastings were ordered - was as attentive as if it was a party of 12. The bar serves decent nacho chips with salsa gratis, which is a welcome surprise. When the glasses come, Bittings actually has the tasting pre-printed (yay!) 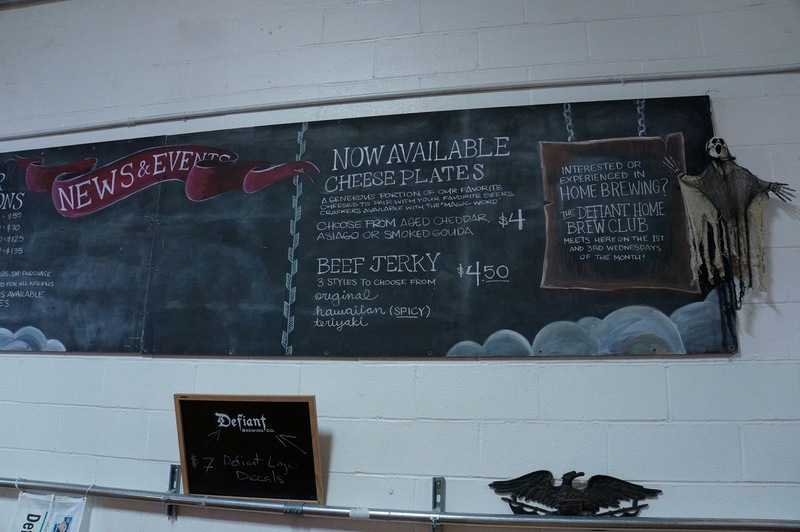 and in order (more or less) of how you may want to try them - i.e. "lighter" to "darker", to use the non-technical terms. Did not try the food but everyone at the bar was pigging out - also saw some decadent dessert go by that caused angina just looking at it. Mike the owner was not available, but just to let him know - good show! Arrived in New Brunswick NJ, where at dinner enjoyed some duck-fat-fried french-fries at the Hyatt. After dinner, it was just a hop skip and a jump to the Harvest Moon. Now this place was hoppin'! There was a live band and it was almost wall-to-wall people. The brewer Kyle was out, but did get a chance to speak with the assistant brewer, who was very proud (rightly so) of the brewpub and their wares. So, not a bad vacation day!